After seeing the Blue Jackets’ stumble out of the gates to start the season turn into an out of control spiral rivaling a five-year old drawing with a crayon, I thought to myself that I have seen this fish before. I hearken back to the NHL’s return from the lockout and how the season had started for the Penguins and see some similarities in the 2-9-1 start for the Blue Jackets. After the Penguins won the draft lottery and the right to draft Sidney Crosby, the Penguins decided to spend rather freely after years of running the franchise like a business and kept their salary low and their roster young. Suddenly big dollars were spent bringing in Sergei Gonchar, Ziggy Palffy, John LeClair, and Jocelyn Thibault (Mark Recchi was signed before the lockout occurred). Somewhat similar to the Blue Jackets’ aggressive offseason that seen James Wisniewski, Jeff Carter, Vinny Prospal, and Radek Martinek enter the fold. Today I’m looking at what I think are the top 10 goalie masks for Halloween, it’s for fun, so just enjoy it! Happy Halloween!!!! Yes, yes, while he never did play hockey, he had to make the list for his nice piece of facial gear. If he did play hockey, you can bet he would see plenty of “slashing” calls coming his way (I’ll stop with the bad jokes now). 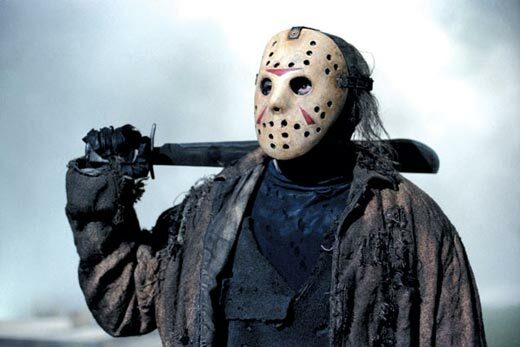 This mask is always associated with Halloween when anyone thinks of hockey involvement in the holiday. “Somebody’s watching me” is the feeling you get when you see this mask. The extra set of eyes is just incredibly creepy. 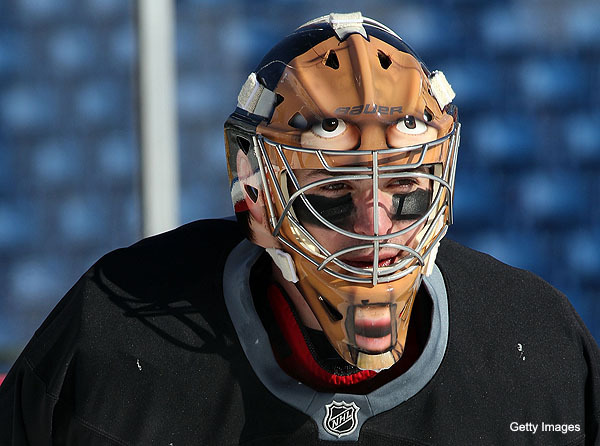 The elongated face on a mask is enough to distract anyone, fan or player. Price recently won his 100th regular season game with The Montreal Canadiens. 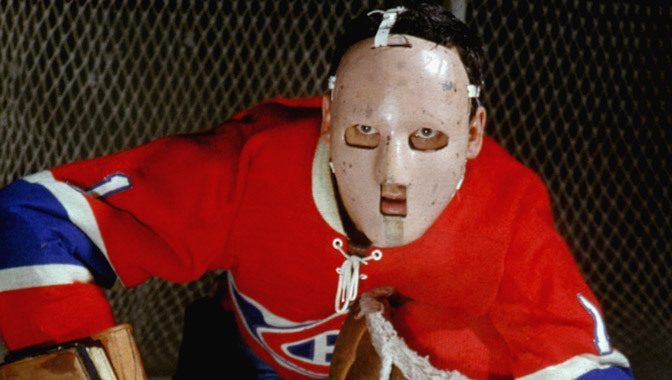 Looking like something straight out of Hannibal Lecter’s personal collection, Plante’s mask drove fear into his opponents. (okay, maybe it was him, not the mask) It also drove him to a Hart trophy, 7 Vezina trophies, and 6 Stanley Cup titles with Montreal. Entered The Hockey Hall Of Fame in 1978. After seeing a sloppy 9-8 Jets win over the Flyers on Thursday night, thanks to a tip from Reading Royals reporter Candice Monhollan, I decided to send myself to the minors. Last night’s ECHL game featured the Trenton Titans (Flyers’ affiliate) hosting the Royals (Bruins/Maple Leafs’ affiliates). There were no TV timeouts, no in-game advertisements, just straight hockey. At one time the play reminded me of a men’s league game at a local rink. Obviously, these guys are professionals, but there were no lengthy stoppages. The whistle would blow and the players would be lined up, ready for the next faceoff. The pace of the game was unbelievable, with all of the players constantly hustling on every shift. They know they can’t take a shift off or they might ruin their chances at moving up to the next level. Most players at this level aren’t high NHL draft picks, so they have to impress to advance. It was a nice change of pace from the NHL game I’m used to watching. These guys aren’t playing for money, making at most $525 per week. They play for the love of the game and a glimmer of hope to make it to the NHL. 1-7-1 And Feeling….Good? You Bet! 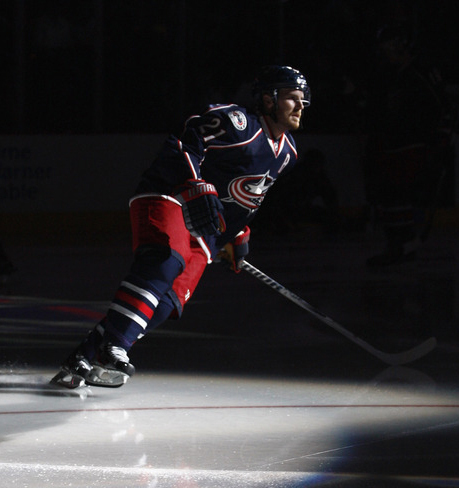 It has been a rough start for The Blue Jackets, 0-7-1, and finally, after a James Wisniewski induced supercharge, the zero is gone, we are now 1-7-1. The celebration on the ice was reminiscent of a Stanley Cup Playoffs victory, my own twitter timeline even acted as if we had just won a Stanley Cup. It was a giant party, and it seemed funny, how can we be feeling good after just one win? leading to the 1-1 goal). With Wisniewski, the defense seemed to know what it was doing, and the combinations seemed to work well 5 on 5, as well as on the PP/PK. Wisniewski was great, blocking shots, and rocketing his own from the point. Clitsome seemed to regain his old form, as did Tyutin and Russell, all making key defensive plays to break up Wings scoring chances. John Moore looked like a completely different player out there, played pretty confident on the ice, had a few minor slip ups, but overall, 110% better than he has been. He also scored his first NHL goal. This defense, helped add to a great goaltending outing by Steve Mason. Today on 590 Radio in Toronto, Eric Lindros officially confirmed that he would play in the Winter Classic Alumni game. He also hinted at a Legion of Doom reunion with John LeClair and Mikael Renberg. The trio only spent three years together, but terrorized the NHL for 305 goals and 666 points. On Saturday night, October 22nd, history was made for the Los Angeles Kings. Goalie Jonathan Quick recorded his third consecutive shutout victory for the Kings in a 1-0 triumph over division rival Dallas. His steak of 188 minutes and ten seconds without allowing a goal is the longest in team history, eclipsing Rogie Vachon’s previous record of 184minutes and 55 seconds established in 1975. Quick also becomes the first NHL goalie to earn 3 straight shutouts since Columbus’ Steve Mason in 2008. Quick’s streak began on October 18th in Los Angeles, the Kings’ home opener against the St. Louis Blues in which Quick stopped 26 en route to a 5-0 win. Two nights later in Phoenix, Quick stopped 28 in a 2-0 victory over the Coyotes, a tight checking affair where some big saves, particularly late in the game, were the difference. Saturday’s 1-0 victory over Dallas was a goaltending duel between Quick and Stars’ goalie Andrew Raycroft, a game in which Dallas outshot the Kings and Quick made Jack Johnson’s lone goal with 4:58 remaining hold up. Having depth on defense is good, but making the choice of who to keep and who to send down is a difficult decision to make. This is the situation that the Kings management is currently facing. With Drew Doughty on injured reserve, Slava Voynov got the call to fill his spot and made his NHL debut in the Kings home opener. That left Davis Drewiske in the same position he was in most of last season: a healthy scratch. With speculation that Doughty could return to the line-up on Tuesday against New Jersey, who stays? Before Doughty’s injury, the Kings were carrying seven defensemen. Why not just play Drewiske? During training camp, Voynov impressed the Kings management so it was only expected that he would get the call. Chatter amongst Kings fans is whether or not they think Voynov should stay with the big club and what should become of Drewiske. There are a couple of questions that I have my own answers for. Why not keep Voynov and send Drewiske to Manchester?